We're not quite ready to pull the masking, but we're close. I have decided we should put on a second coat of green paint to get better coverage. These plaster walls are not smooth, so it's a bit of a challenge to get the wall thoroughly covered. Once it's had several hours to dry, I'll be back up there to apply a second coat. Yesterday, I put up a coat of primer. Since I hadn't masked the walls before staining the wood, there was quite a bit of stain slopped onto them. I was hoping the primer would help cover the dark splotches and it did. 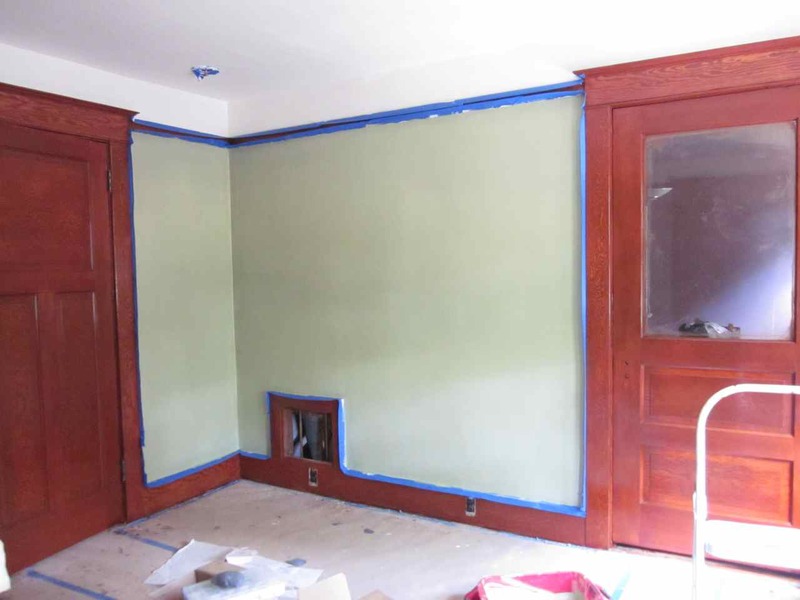 When I bought the paint last fall, I had planned to paint the master bedroom hubbard squash and the guest bedroom ruskin room green, but recently I decided to switch them. The green paint will match our bedroom furnishings better than what we're planning to move into the guest room. The ceiling and frieze are painted in white hyacinth. Now that we're so close, I'm thinking about whether I should go ahead and apply a stencil in the frieze this summer, before we move our furniture back from storage. Though it's hard to pick one since there are so many wonderful choices!